Dental Implants are thought to be one of the best technological advances in replacing a missing tooth. Dental Implant Cardiff companies have worked over the years to perfect this technique into the procedure that we know today. But where did dental implants first begin and how have they advanced over the years? It is thought that some of the first early implants were used in ancient China where bamboo was carved into peg shapes to replace the missing tooth in around 2000 BC. This was a common place practice during these early times but would have been subject to a lot of pain and also the pegs would eventually rot away and need to be replaced. It wasn’t until 1000 BC that the first records of using metal teeth have been found in the mouth of an ancient Egyptian King. The timing of the insertion of the replacement tooth is not clear and this may have occured during his living years or may have been replaced after his death. The replacement tooth is from copper and has been hammered into the space where the original tooth would have been. A tooth made from Iron dating back to 300 BC was found in a Celtic grave in France and again it is thought that this would probably have been implanted into the jaw following the individuals death as the pain to have this completed would have been unbearable and early forms of anaesthetic would not have taken any of this pain away. The reasons for this individual having a tooth implanted after death are not clear but just like the Egyptians there were beliefs surroundings a person’s death that meant rituals took place to ensure that the individual would be accepted into the afterlife. 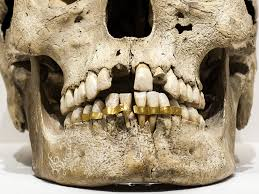 Fast forwarding to the 18th Century experiments were undertaken looking at the use of alloys and gold metal to make implants for teeth but they were not entirely successful. It was not until 1952 that an orthopedic surgeon looked into the use of a titanium cylinder that would be fused together with bone and used to replace a missing tooth and in 1965 the first titanium implant was placed in the mouth of a volunteer. Since this first successful procedure the technology has been further advanced and titanium screws are now used to place into the jaw area where the tooth is missing and once the screw has successful fused with the bone in the jaw and the area hs healed from the initial procedure a crown can then be attached to the top part of the screw that is left protruding above the gum line. All, thankfully, with the help of carefully placed local anaesthetic to prevent pain.